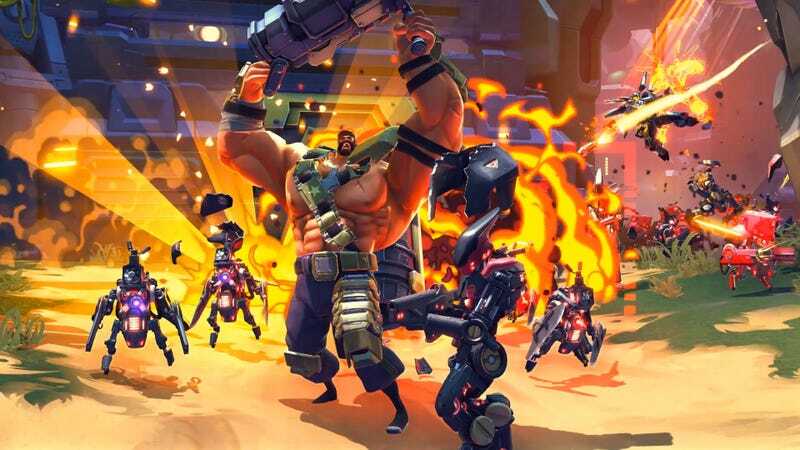 Starting today, anyone with an Xbox One, PlayStation 4 or PC can download the free trial of Gearbox Software’s hero shooter Battleborn, gaining instant access to all of the game’s competitive multiplayer content. It’s like it’s gone half free-to-play. Last fall we reported that Battleborn would be going partially free-to-play, with unlimited multiplayer with the co-op story content locked behind a paywall. Sources tell us the launch was delayed several times, but the Battleborn free trial is exactly what we expected it to be. Players who download the Battleborn free trial are able to choose from a rotating roster of 6 of the game’s 30 characters, taking them into battle across four competitive multiplayer modes (with a fifth on the way). Free trial players will earn character and command ranks just like paying players—only the character selection will be initially limited. What the free trial does not include is any of the game’s cooperative story missions. In order to access story content, trial players will need to upgrade to the full game, though characters, cosmetic enhancements and boosters can be purchased a la carte via the in-game store. You can get more information on the free trial over on the Battleborn blog.